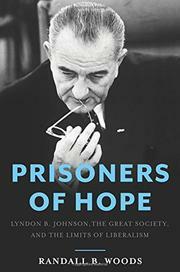 Lyndon Johnson’s Great Society and the War on Poverty have had mixed but lingering results, mostly positive. Woods (History/Univ. of Arkansas; Shadow Warrior: William Egan Colby and the CIA, 2013, etc.) is a biographer of Johnson (LBJ: Architect of American Ambition, 2006), and this new text is filled with LBJ’s good, bad, and ugly sides. There’s a conversation, for example, with presidential aide Joseph Califano about Califano’s weakness on a negotiation with Congress that will prompt roars of laughter or groans of disgust. The author argues—and demonstrates with considerable effectiveness—that one current (and popular) view of LBJ’s spate of social legislation as a failure is simply inaccurate. He shows the enduring positive effects of Medicare, Medicaid, and other federal programs that dramatically improved the lives of millions. But Woods also recognizes the failures, many of which were exacerbated by the escalating Vietnam War and its financial demands on the budget. LBJ’s plummeting popularity emasculated his effectiveness with the public and with Congress, on whom he’d demonstrated a profound and powerful sway. Woods also deals with the racial explosions of the mid and late 1960s, riots and violent demonstrations that caused the white backlash still evident today. He writes affectingly about the assassinations of Martin Luther King Jr. and Robert F. Kennedy, the ensuing urban riots, and the worsening inability of LBJ to exercise his desired amount of control. Through the author’s clear prose, we see the frustrations and feelings of betrayal LBJ felt; he had done his best to try to alleviate poverty, to improve education and civil rights, and to work on issues of housing, discrimination, and health care. Yet the war and the increasing public political polarization—now far worse than in Johnson’s day—eventually crumbled all. A sympathetic but also gimlet-eyed scholar’s look at a towering physical and political presence who learned, to his sorrow, that good intentions were insufficient.